Massachusetts began a near-universal healthcare system circa 2007. The entire United States will begin one twelve months from now, pursuant to its "Affordable Care Act" (ACA). Can a labor economist interested in the ACA learn from the MA experience? The ACA design is said to have been influenced by the MA program. I agree with that for the purposes of discussion. The CBO and other analysts of the ACA have jumped to the conclusion that the major MA labor market effects, if any, of the MA reform are informative about the US labor market effects of the ACA. It may be true that the HEALTH MARKET effects of the ACA will be similar to the MA health market effects of the MA reform, but economic theory contradicts the assumption that the two laws have similar LABOR MARKET effects. From a labor market perspective, two margins are important: the margin between working and nonworking, and the margin between employer-sponsored insurance (ESI) and other sources of insurance. The ACA and the MA situations are entirely different in these dimensions. The ACA is the first piece of federal legislation that gives essentially free health insurance to people not working but not technically poor (with the exception of 18 months or so during the "stimulus" when COBRA payments were 65 percent subsidized for people on unemployment insurance). In this way, the reward to working in the US will be significantly lower after 1/1/2014 than it was before. The MA reform did not change this part of the reward to working in MA because health insurance was already close to free for the unemployed. By the time MA had implemented its health reform, its "Medical Security Program" (MSP) was almost 20 years old. MSP gave (and still gives) people on unemployment insurance (UI) the option to have the state (actually, I think MA calls itself a Commonwealth) pay for 80 percent of their private health insurance premiums (up to $1200 per month!) or to receive health services directly from the Commonwealth, for as long as their UI lasts. MA's MassHealth Essential program provides benefits for the long-term employed (whose UI benefits have presumably expired). Like UI itself, these two programs are not asset tested. The employer financing of the two HI-for-unemployed programs is not experience rated (i.e., employers who layoff more do not have to pay more). The MA reform even served to reduce UI a bit because the UI benefit amount is based on cash compensation, and the MA reform was encouraging the labor market to tilt a bit away from cash compensation and toward fringe benefits. Another part of the reward to working comes from the sliding scale subsidies to people working for employers not offering ESI. Both MA and US reforms have subsidies like these, but the MA subsidies apply to a much smaller slice of the population. For one, the frequency of no-ESI employers is much greater in the US pre-ACA than it was in MA pre-MA-reform. Second, the MA subsidies applied to persons up to 300 percent of the federal poverty line (FPL), as compared to the 400 percent threshold in the ACA; there's a lot of people in that 300-400 percent range. Third, the ACA subsidies will be more like cash than the MA subsidies because ACA beneficiaries will use them for pretty much any health insurance plan (for example, the same health plan that their Congressman and his family will use) whereas the MA subsidies can only be used for one of five state-sponsored plans. Judging by their pre-subsidy costs, the MA Commonwealth-sponsored plans appear to offer less than private sector plans. This MA practice enhances the reward to working: as one moves above 300 percent of the poverty line he loses his subsidy, but he also gets access to better health plans. The end result of the MA sliding scale subsidy is that only 0.16 million people (including dependents) receive them in a Commonwealth with a population of 6.6 million. The ACA subsidies, on the other hand, are widely expected to be received by a much greater fraction of the US population. Naturally, a subsidy hitting a larger fraction of the population has a larger labor market impact. So the only ways that MA health reform can be informative about the effects of the ACA on the quantity of labor (e.g., the fraction of the population employed) is that: (a) the reward to working doesn't matter that much or (b) analysts have made a correction or adjustment for this fundamental difference between the two reforms. So far, I doubt that either condition holds. The MA reform is also quite different from the ACA in terms of how it changes the incentives for employers to offer health insurance. There are many differences in this regard, but I begin by naming one or two. The MA reform distinguishes offering health insurance to employees from helping employees pay for it. In MA, employers can offer health insurance to employees without an employer premium contribution by setting up a "125 plan," which allows employees to use their own pre-tax dollars to buy health insurance (for employees below 300% FPL, I think this opportunity includes the purchase of subsidized plans). Under the 125 plan, the employer only assists a bit in the administration of the premium payments/withholding. The MA employer penalty for NOT offering a 125 plan (or ESI narrowly defined) can potentially be large: the employer can, in effect, be liable for all of the health costs the Commonwealth of MA incurs in caring for its employees. A small to medium-sized employer with the bad luck of having two employees get triple-bipass surgery in the same year may find himself wiped out by this "employer free-rider penalty." Admittedly, as of 2010 the Commonwealth of MA had yet to collect a single dollar of the free-rider penalties, but employers may nonetheless be scared to death of that liability, which may have led them to adopt 125 plans in mass (and thereby the Commonwealth gets no revenue from the penalty). The MA employer penalty for not paying for any/enough of their employees' health insurance is just $295 per employee per year. The ACA does not attempt to encourage 125 plans. In fact, MA may have to eliminate this part of its health reform when the ACA goes into effect. The ACA penalizes employers $2000 (and growing) per full=time employee if the employer does not offer affordable ESI. One issue here is measurement. Does an employee who buys insurance through a 125 plan consider himself as having ESI? My guess is that he does, and that some of the population surveys are not well suited to detect the distinction, but more research is needed on this. Until then, I'm not sure how to interpret findings that ESI increased somewhat in MA after its reform. Second, if we include 125 plans as ESI, the MA employer penalty for not having ESI in one form or another is potentially much larger than the $2000 ACA penalty. Third, as noted above the MA subsidies to persons without ESI are infrequent as compared to the expected frequency of ACA subsidies. Moreover, the MA subsidies are less because MA restricts subsidy recipients to one of five less costly plans. Thus, MA employers have relatively few employees who would gain if ESI were dropped. In summary, ACA proponents have likely been mistaken in taking comfort in the MA experience: the MA and ACA reforms are not comparable from a labor market perspective. A fully implemented and enforced ACA will significantly add to distortions on the margin between unemployment and working, whereas the MA reform did not. Via its sliding scale subsidies, a fully implemented and enforced ACA will distort other decisions that enhance family incomes, whereas the MA sliding scale subsidies hit a much smaller slice of the MA labor market. A fully implemented and enforced ACA will, on a variety of margins, move people out of jobs offering ESI, whereas the MA changes in these margins (if any) were significantly less, and different. Surely, if it cares about its labor market, America was imprudent to adopt such a sweeping law before these issues could be acknowledged and better understood. As Democrats and Republicans haggle over federal taxes and spending, another important policy tool gets less attention: regulation. Government has a variety of ways it can achieve its objectives, including subsidies, taxes and regulation. For example, the government might attempt to help disabled people by subsidizing handicapped-accessible buildings. Or it could levy an extra tax on buildings that are not handicapped-accessible. Or it could simply refuse to permit structures to be built, or used in various situations, without being handicapped-accessible. All three strategies are likely to affect building activity, increase the prevalence of handicapped-accessible buildings and in so doing help people with disabilities, as intended. The first strategy is ordinarily called government spending; the second, taxation; and the third, regulation. Politicians have devised various budgetary gimmicks to help disguise what they tax and spend, and the sunset provision that led to next month’s fiscal cliff is one of them. Nevertheless, experts and even the voting public get an idea of the importance of taxes and spending in the economy by looking at budget totals and perhaps a few of the largest line items. The same cannot be said for regulation, which lacks any official budget. Attempts have been made to quantify regulation by the number of pages of law or pages of agency rules: President Ronald Reagan once bragged that his administration reduced one area of regulation to 31 pages from 905. However, pages can be misleading, because some words, sentences and paragraphs have more impact than others. For example, some laws, like those requiring children to attend school, have little impact because a vast majority of American families would send their children to school even if the law did not require it. Other laws, like many curfews, take up space on the books but are not enforced. Because regulations have so far been poorly quantified, it is interesting to see a recent study of workplace regulation by complianceandsafety.com. It attempts to measure the aggregate of importance of workplace regulation by the dollar amount of fines collected by the Occupational Safety and Health Administration. Its chart, reproduced below, looks at the fines in reverse chronological order, and colors years according to the political party of the president in power. 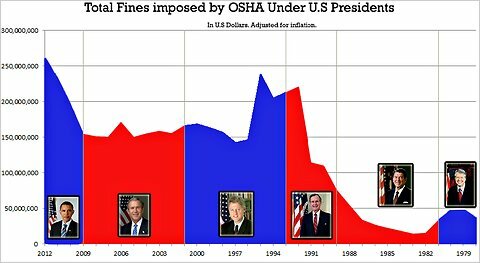 OSHA fines have increased sharply since 2009. Perhaps more surprising is that the largest fine increases previously were under a Republican president (the first President George Bush) and the largest reductions were under President Bill Clinton. As with taxes and spending, we cannot necessarily conclude that more regulation is “bad” or “good,” but it would be helpful for experts and voters alike to see a rigorous accounting for government regulation. The CBO, RAND, and others claim that the ACA's individual mandate BY ITSELF increases the prevalence of employer-sponsored health insurance (ESI). That is, there would be more ESI with the actual ACA than there would be with a hypothetical ACA that did not have the individual mandate. I agree that an insurance mandate would increase insurance participation. It also seems natural that participation would increase in all of its forms, including the ESI form. But I wonder whether the latter conclusion survives economic reasoning. One issue is whether we're looking at the fraction of employees with ESI or the fraction of employees who are offered ESI (the difference is the fraction of employees who are offered ESI by their employer but turn it down). For the moment, let's focus on the latter: more specifically an employer's decision to offer ESI under the actual ACA and a hypothetical ACA without the individual mandate. One reason that employers might like ESI better WITHOUT the individual mandate is that they can make ESI optional to their employees. Assuming that employees prefer options to coercion, optional ESI is more employee-friendly than coerced ESI and therefore optional ESI competes better against the third alternative of no ESI. It's like having a company softball team: the average employee may like it better if softball is an optional activity rather than a required one. If for some reason the government required softball-haters to participate in their company softball games, the company might well consider eliminating the team and recommending the softball-loving employees to play their softball away from work. It's conceivable that the individual mandate could make ESI more efficient by increasing ESI takeup among the employees. But the opposite is also conceivable: just like company softball might be less pleasant if softball-haters were forced onto the field. More discussed surrounding the ACA is that the individual mandate by itself makes NONGROUP coverage (that is, non-ESI health insurance) more efficient. E.g., the aforementioned RAND study claims this. If true, the individual mandate reduces the employers' COMPARATIVE advantage in offering health insurance, so fewer employers may offer it. My guess is that the individual mandate BY ITSELF reduces the number of employers offering ESI. Among those who offer ESI, I agree that the individual mandate increases ESI takeup among their employees. But the net result could still be that the individual mandate reduces the economy-wide fraction of employees with ESI. 20 years ago, experts used to recognize that "solving" the health uninsurance problem would create labor market problems. The was published in 1994. Guess who wrote it? ...Alan B. Krueger and Uwe E. Reinhardt. Krueger is now Chairman of the President's Council of Economic Advisers. Interestingly, 15+ years later the Administration did not mention high marginal tax rates as one of the unfortunate byproducts of the ACA, and no adjustment has been made for their depressing effects on the labor market and on government revenues. Moreover, Krueger and Reinhardt (and dozens of other accomplished economists) signed a 2011 letter to congress touting their "strong conclusion that leaving in place the Patient Protection and Affordable Care Act of 2010 will ... promote more rapid economic recovery in the immediate years ahead." Now it is considered partisan to acknowledge the basic economics of incentives, and that "[ACA propoents] can honestly say that economic and clinical claims made on behalf of the repeal effort are generally viewed as non-substantive." In “A Tale of Two Cities,” Dickens wrote, “It was the age of wisdom, it was the age of foolishness.” The governments of the United States and Britain are embarking on different approaches to helping their poor and unemployed, and one of them may regret its policy decisions. In the United States, the welfare system includes dozens of federal programs, enumerated by Robert Rector of the Heritage Foundation as those “providing cash, food, housing, medical care, social services, training and targeted education aid to poor and low-income Americans.” Beginning in 2014, more programs will be added and expanded by the Patient Protection and Affordable Care Act: new health-insurance premium-support programs, new cost-sharing subsidies for out-of-pocket health expenditures, financial hardship relief from the new individual mandate penalties, new subsidies for small businesses employing low-income people and expansion of Medicaid. The Congressional Budget Office estimates that the Affordable Care Act’s means-tested subsidies and cost-sharing will implicitly add more than 20 percentage points to marginal tax rates on incomes below 400 percent (see Page 27 of the C.B.O. report) of the poverty line (a majority of families fit in this category) by phasing out the assistance as family incomes increase, although a number of families will not receive the subsidies because they already get health insurance from their employer. These marginal tax-rate additions are on top of the marginal tax rates already in place because of personal income taxes, payroll taxes, unemployment insurance, food stamps and other taxes and means-tested government programs. In 2014, some Americans will be able to make almost as much from combined benefits as they would by working, and sometimes more. In summary, the United States intends to move in the direction of more assistance programs and higher marginal tax rates, while Britain intends to move in the direction of fewer programs and lower marginal tax rates. Either country, or both, may ultimately fail to fully carry out the new programs by granting waivers and exceptions, refusing to administer them or by rewriting its new laws. But if both do follow through, perhaps future empirical economic research comparing the United States and Britain will reveal which country is living an age of wisdom and which one in an age of foolishness. Beginning in 2014, essentially everyone without insurance coverage from an employer (or the employer of a family member) will be eligible for significant subsidies for health insurance expenditures, at least if their family income is below 400% of the poverty line (a growing majority of America fits in that category). These ACA subsidies are so large that most of the time they outweigh the penalties employers will pay for not providing coverage. As compared to 2013, there will be less demand for employer health insurance coverage in 2014 because other means of health insurance coverage are getting subsidized. Naturally, this should reduce the share of employers who offer coverage and reduce the number of people receiving coverage through an employer. A number of economists are predicted this. However, I am afraid that they are under-estimating the margins on which the labor market can respond (sound familiar?) and thereby under-estimating the negative impact of the ACA on the fraction of people receiving health insurance coverage from an employer. As far as I can tell, the prevailing approach to quantifying the effect is to look at econometric studies measuring the effect of health insurance costs (usually costs associated with income tax exclusion rules) on the likelihood of an employer's offering coverage. This CBO report discusses its own estimates and the estimates of others; the debate seems to be about which of the econometric estimates to use. To see why this approach would, barring another offsetting mistake, lead to an underestimate, suppose the employer insurance offerings were completely insensitive to costs. In other words, we are assuming for the moment that employers continue to offer or not offer insurance in 2014 as they did in 2013. Still, the ACA would reduce the number of people getting health insurance coverage through an employer. First, the ACA significantly raises marginal tax rates (the CBO was the first to notice this, see their most recent discussion). That will cause fewer people to work for any type of employer (with or without coverage). (To the extent this is a significant factor pushing employer coverage rates below forecast, you can expect that the forecasters will blame their miss "on the bad economy" but the bad economy itself would be the result of the ACA). Second, the ACA will make firms offering insurance to their employees less competitive (in the markets in which they sell their output) with other firms, because the subsidies go only to the latter firms. In other words, some of those subsidies will be passed on to consumers and investors, who adjust their spending patterns away from the items made by the former firms and toward the items made by the latter. Third, the ACA will change factor market comparative advantage (I have been learning about this as part of a project with Chicago grad student Trevor Gallen). Even if the total amount of workers at employers with and without coverage were constant and there were no change in the allocation of production between the two types of firms, employers without coverage would, in effect, give up some of their skilled workers in order to get unskilled workers. These two types of workers are not traded one-for-one because, by definition, a skilled worker is more productive than an unskilled worker. In other words, comparative advantage by itself says that employers without coverage will get more workers but of lesser average "quality" while employers offering coverage will get fewer workers but of greater than average quality. By my count, there are a total of four margins by which, in response to the ACA, the labor market would reduce the fraction of people receiving health insurance through an employer. As far as I can tell, the literature about the ACA and insurance coverage has so far considered only one. • one per cent were anxious about getting into debt before they started receiving pay. unprompted format (87 per cent)." Read the full report here. Of course, these things do not happen in America. 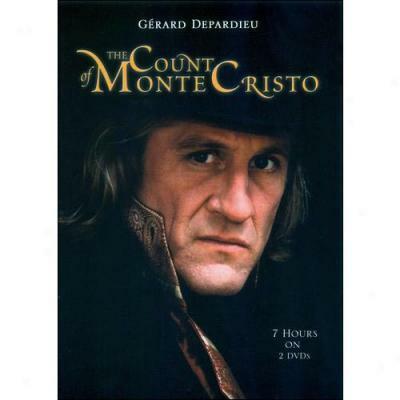 "I leave because [French leaders] consider that success, creation, talent, difference, in fact, should be sanctioned" says Gérard Depardieu. Click here to rent/buy one of his films. It is commonly said that the sales tax affects workers and non-workers alike, as opposed to payroll and income taxes which tend to fall on wage earners, because everybody buys things but not everyone workers. The elderly, for example, are harmed more by a sales tax than by a wage tax. There is some truth to this conventional wisdom, but it has been exaggerated because many income streams are automatically indexed to inflation (specifically, the CPI), and CPI inflation reflects sales taxes. For example, UK unemployment benefits are indexed to the CPI. When the UK increased its VAT, inflation was created and the unemployed automatically got a raise while workers did not. Another example, US social security benefits are indexed to the CPI via the Cost of Living Adjustment. Thus, if the U.S. were to implement a VAT, the CPI would go up and the elderly would automatically get a raise. Workers would not. On the other hand, newly retired people have their social security benefit indexed to wages, which would not automatically increase after a VAT. So new retirees would, in effect, pay the VAT throughout their retirement. Elderly people also have non-social-security income sources, which are sometimes not indexed to inflation. To the extend that elderly relied on non-indexed income, they would pay part of the VAT too. In terms of incentives, the VAT discourages work because people work in order to buy more. But, as noted above, there is an addition work-discouraging effect of sales taxes: through CPI-indexation it reduces the income gap between workers and non-workers. Did Poverty Rise or Fall? Adjusted for taxes and benefits. Aloc Sherman says it was constant. Shawn Fremstad says says "Social insurance and the Obama Stimulus, limited as it was, have and continue to play a fundamentally important role in limiting the damage. But even taking that into account, real poverty really did rise during the recent recession." Contrary to Mr. Fremstad's claims, my post on this matter clearly explains that I do not have my own estimate and that "The measurement of poverty and its trends is an important and continuing research area, and future research could suggest that the poverty rate had increased." Perhaps Sherman and Bernstein are wrong. Perhaps they are right. Maybe what Mr. Fremstad really advises is not to rely on Sherman and Bernstein. Government safety net programs were put on steroids by the 2009 stimulus law, erasing incentives for a significant fraction of the unemployed. 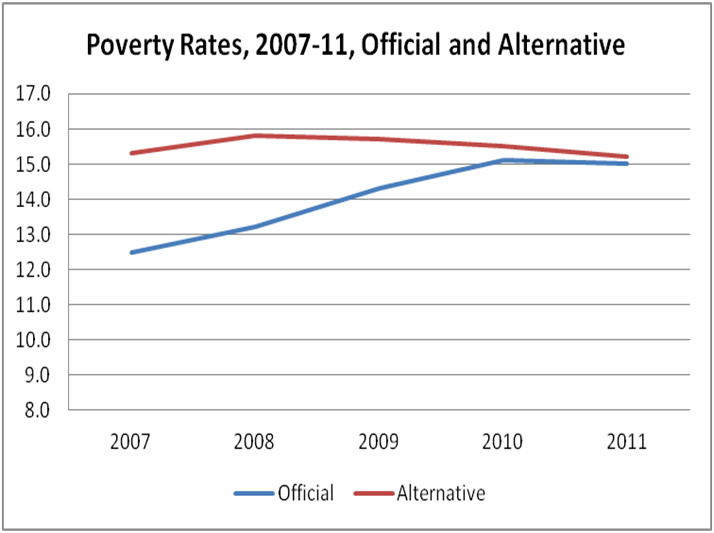 Last week I noted that poverty, when measured to include taxes and government benefits, did not rise from 2007 to 2011. That result, I contended, indicated that people in the neighborhood of the poverty line faced marginal tax rates of about 100 percent. I also noted that 100 percent marginal tax rates were excessive. These three statements generated many angry comments, so it’s worth examining them in more detail. One possibility is that the poverty rate did rise significantly, even when adjusted to reflect taxes and government benefits. That possibility would contradict Jared Bernstein’s work in this area, because he concluded that America had “the deepest recession since the Great Depression and poverty didn’t go up.” It would also contradict Arloc Sherman’s findings that the poverty rate was essentially unchanged (thanks to generous new subsidies). The measurement of poverty and its trends is an important and continuing research area, and future research could suggest that the poverty rate had increased. However, future research could also point in the other direction. In 1995, a panel established by the National Research Council to evaluate poverty measurement concluded that it might make sense to recognize not only the monetary resources available to families, but also the amount of free time they had. After 2007, many people found themselves with less pretax income and more free time because they had lost their jobs. Because the official poverty measures consider only the pretax income, adjusting poverty measures to reflect free time would cause the poverty rate to fall more, or increase less, after 2007. One might wonder exactly how, in theory, poverty rates remained fixed when millions of people lost their jobs, and when the government did not essentially replace all the disposable income lost because of layoffs. The magnitude of marginal tax rates imposed by the government is ultimately an empirical question, though. As far as I know, none of my detractors have offered any estimates. I have been examining marginal tax rates under the American Recovery and Reinvestment Act of 2009, especially as experienced by families near the poverty line. The chart below shows some of my results pertinent to Mr. Bernstein’s poverty measures. The chart also organizes unemployed people in terms of what they earned weekly before layoff, with special attention to the group in the $250 to $349 range, which is near the weekly earnings of a full-time minimum-wage job. Among the unemployed who had earned near minimum wage (shown in red in the chart), a majority had a job-acceptance penalty rate of at least 100 percent, meaning that accepting a job with the same pretax pay as they had before layoff would not increase their disposable income. If they were to accept such a job, all the compensation would go to the Treasury in additional personal income taxes, additional payroll taxes and reduced unemployment insurance benefits (under the stimulus, unemployment insurance benefits alone were more than half of the pretax pay from the previous job), and in some cases reduced benefits from the Supplemental Nutrition Assistance Program, known as SNAP, and Medicaid. Only 18 percent of those earning near minimum wage had a job-acceptance penalty rate of less than 80 percent. My results consider the unemployment insurance program and its federal additional compensation and subsidies for Cobra, which gives workers who have lost their jobs the right to purchase group health insurance for a limited period of time; SNAP; Medicaid; the regular personal income tax (both federal and state); the earned-income tax credit, the child tax credit, the additional child tax credit and the “making work pay” tax credit. 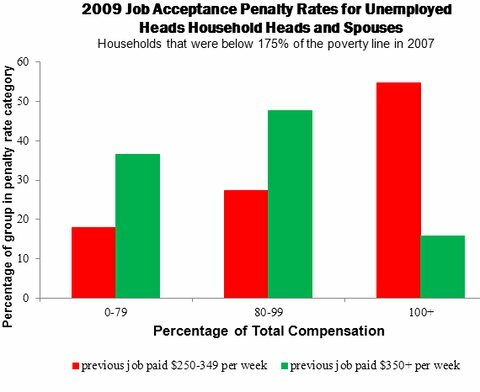 Job-acceptance penalty rates of 100 percent or more are probably more prevalent than shown in the chart because I did not include child care costs among employment expenses and did not include programs like disability insurance, Temporary Assistance for Needy Families and Supplemental Security Income, means-tested housing subsidies, means-tested tuition assistance, means-tested energy-assistance programs and other programs that impose positive implicit marginal tax rates. I agree with Mr. Bernstein that government policy, especially the 2009 stimulus law, is responsible for preventing a rise in the poverty rate. But it achieved that end by erasing incentives for a significant fraction of the unemployed. Food stamps, unemployment insurance, and other subsidies to persons who are unemployed and otherwise with low incomes, have recently been made more generous and available in more situations. Did extra transfers help prevent a deeper recession, or did it amplify and prolong it? Economists cannot fully answer these questions without examining the incentives of persons receiving the transfers. The purpose of this paper is to quantify the number of people who recently had essentially no short-term financial reward from working, and how that number might have been different if safety net program rules had been made more generous, or if they had remained what they were in 2007. American economists often discuss the unemployment insurance (hereafter, UI) system and its moral hazards as if the penalty for accepting a new job were about 50 percent of compensation, which would suggest that the financial reward to working would be positive and significant in all but a few rare circumstances. At the same time it is commonly noted that the average weekly unemployment benefit of about $300 barely exceeds the compensation from a full-time minimum wage job, and for this reason alone UI is almost always inferior to a real paycheck. These claims are incorrect because they ignore payroll taxes, income taxes, and other safety net programs. The tax arithmetic suggests that many UI participants would, even under 2007 rules and even ignoring all safety net programs aside from UI and the personal income tax, keep about 30 percent – and maybe as little as ten percent – of the compensation generated by accepting a new above-minimum-wage job because taxes typically took as much of the reward from working as foregone unemployment benefits did. These thin margins essentially disappeared under the American Recovery and Reinvestment Act of 2009 (hereafter, ARRA). Even when helping the poor is a primary policy motivation and the wage elasticity of labor supply is low, optimal tax theory frowns on labor income tax rates that equal or exceed one hundred percent (as long as work is not socially harmful) because at a one hundred percent rate there is no longer a tradeoff between efficiency and government revenue. From a positive point of view, economists expect that employment rates will be low, if not zero, in groups of people who are aware that they receive no financial reward from working. These are a couple of more reasons to quantify the prevalence of marginal tax rates that are near or exceed one hundred percent. The paper begins with a brief overview of the major safety net programs affecting the financial reward to working. The first quantitative results are 2009 marginal tax rates and their components for some of the more common tax situations encountered by American workers and their families. The rates are calculated for three scenarios: actual benefit and tax rules, benefit and tax rules as they would have been if they had not been changed since 2007, and benefit and tax rules as they might have been in a bigger stimulus. The following section considers the rich and complicated variety of possible tax situations in order to arrive at estimates of the number of household heads and spouses with little or no financial reward to accepting a new job. A “demand shocks and job search gambles” section shows how job acceptance rewards are nonlinear in the amount of a job offer, and the final section concludes. Before the recession began, going from unemployment back to work did not pay that well for someone eligible for unemployment benefits, but almost always paid a little something, with at least twenty percent of compensation from a job going toward enhancing the new employee’s disposable income above what it was during the spell. Despite its inclusion of a “making work pay” tax credit and its expansion of the “earned income tax credit,” the ARRA increased marginal tax or “job acceptance penalty” rates for the vast majority of the unemployed and essentially erased the short-term financial benefits from working for two to three million non-elderly and unemployed household heads and spouses. About five million had their job acceptance penalty rates increased above 80 percent by the ARRA. Layoffs have also long been subsidized by unemployment insurance and other safety net programs, but again typically public treasuries would pay for less than 90 percent of the compensation lost from a layoff, while employer and employee had to absorb the rest. When the ARRA was in full force, over three million workers could be laid off with a subsidy of 90 percent or more, and another five million with a subsidy rate of 80 to 89 percent. A bigger stimulus would have put as many as 30 million workers in that situation. To the degree that unemployment responds to the financial incentives for working, the ARRA and other programs assisting the unemployed interact with demand shocks in determining the number unemployed: an adverse demand shock increases unemployment more under the ARRA than it would if the same demand shock were experienced under 2007 tax and subsidy rules. None of these results hinge on the increase of the duration of unemployment benefits from 26 to 99 weeks, which was achieved by legislation separate from the ARRA (United States Department of Labor 2011). I count each unemployed person only when they are laid off; the results here reflect the level of benefits delivered by tax and subsidy programs to unemployed persons beginning to receive UI. UI and other program eligibility rule changes are not considered in this paper but are important for quantifying changes in marginal tax rates between 2007 and 2009, and comparing such changes across demographic groups. My findings of large, even confiscatory, job acceptance penalty rates are not the result of “cliffs” in transfer program formulas in which many dollars of benefits are lost for earning a particular marginal dollar (Yelowitz 1995) because I look at the consequence of more “discrete” decisions of accepting a job, or initiating a layoff, that change calendar year income by thousands of dollars. Instead, my large rates reflect the combination of tax and subsidy rules, especially unemployment insurance. Not surprisingly, my rate estimates exceed those of previous studies of transfer program marginal tax rates that omit unemployment insurance (Holt and Romich 2007) and exceed those of previous studies of unemployment insurance that ignored taxes (Chetty 2008). But taxes, unemployment insurance, and other transfer programs have recently contributed significantly to the living standards of the poor and unemployed (Sherman 2011), so we cannot have a full understanding of the magnitude of marginal tax rates without considering the safety net broadly. I have likely somewhat under-estimated the number of people with marginal tax rates in excess of one hundred percent because I have omitted a number of other possible sources of implicit taxes. They include other means-tested cash assistance programs such as Disability Insurance, TANF and Supplemental Security Income; means-tested housing subsidies; means-tested tuition assistance; and means-tested energy assistance programs. They also include court-enforced wage garnishment associated with the collection of delinquent consumer, tax, and child support debts. At the same time that incentives to retain and accept jobs were erased for millions, millions were laid off from their jobs and remained unemployed for an extended duration. I estimate that 2.3 million additional non-elderly household heads and spouses were laid off in 2009 than would have been laid off if the 2000-2007 average number of layoffs had persisted through 2009. The number of unemployed household heads and spouses were about 5 million greater than normal. In other words, the extraordinary numbers of persons laid off and unemployed are of roughly the same magnitude as the numbers of persons having their incentives essentially erased by the ARRA. The fact that more persons would have had incentives erased if the ARRA had been more generous to the unemployed suggests that it is possible that a bigger stimulus would have resulted in more unemployment than the actual stimulus did. Chetty (2008) estimates the U.S. UI replacement rate as 50 percent for the purposes of demonstrating that it might be slightly less than optimal. See also Fujita (2010). Behavior in the neighborhood of 100 percent tax rates would be especially interesting if it were true that (a) when tax rates are lower and more typical of their historical values, the amount of unemployment were insensitive to the amount of the UI benefits and (b) unemployment would be high if unemployment paid better than working. To see this, try drawing a graph of the relationship between unemployment and the size of UI benefits that satisfies the properties (a) and (b): it must turn or jump sharply toward high unemployment as the benefit approaches the amount of pay from working. When measured to include taxes and government benefits, poverty did not rise between 2007 and 2011, and that shows why government policy is seriously off track. When somebody earns, say, $10,000 by working, he should keep some of it for himself and his family rather than handing it all over to the government. By the same reasoning, when someone loses $10,000 by not working, he should get some help from the government or from others in the forms of reduced taxes and enhanced benefits but still should bear a portion of that loss himself. Economists debate the fraction of wages that workers should keep for themselves, because the optimal fraction is a trade-off between incentives, insurance, support of public goods, freedom and other factors. Libertarians and other believers in small governments might set the fraction at 80 percent or more. Other economists think that incentives have an effect on behavior, but incentive effects are small, so we can safely set the fraction at 30 percent, or even a bit less. But I thought economists agreed that the fraction should not be zero, so that people losing money by not working would bear a portion of the loss. If people with declining incomes found them entirely replaced by government help, that amounts to 100 percent taxation (providing more benefits as income falls is sometimes called “implicit taxation”). This application of the means test is bad economics as well as bad sociology. It is almost as if our present programs of public assistance had been consciously contrived to perpetuate the conditions they are supposed to alleviate. Professor Tobin called the 100 percent tax situation demoralizing because the affected people find that all of the benefits of their hard work and success go to the government in the form of more tax receipts and fewer benefit payments. The unintended result would be less work and more families earning less than the poverty line, which is why Professor Tobin described such policies as perpetuating poverty. If, as economists recommend, everybody’s tax rate is effectively less than 100 percent, then someone with disposable income of, say, 110 percent of the poverty line should find himself falling into poverty when he loses his job. His living standards would not fall to zero because he should be getting some help in terms of reduced taxes and increased benefits. But optimally his disposable income would fall to 80 percent of the poverty line, and perhaps below, until he found a new job. Under the Obama administration, workers with disposable income in the neighborhood of the poverty line did not, on average, see their job losses during the recession translate into significant reductions in their disposable income. As Jared Bernstein put it, America had “the deepest recession since the Great Depression and poverty didn’t go up.” He shows that the percentage of people in households with disposable income less than the poverty line was 15 percent in 2011, just as it was in 2007 before the recession began. In fact, the percentage fell a bit after 2008 when the stimulus law went into effect. The results suggest that the government was helping too much. If they had been following the advice of Professor Tobin and all other economists who say they believe that tax rates should be less than 100 percent, the fraction of households with disposable income below the poverty line would have risen as a consequence of millions of lost jobs, just less than it would have without any government help. Erasing incentives is not the way to a civilized society but rather to an impoverished one. Read the baby one of my blog posts! A time for more nations from Sharif on Vimeo. Why Doesn't Poverty Rise During a Deep Recession? Because government benefits replace almost every dollar that people (in the neighborhood of the poverty line, at least) lost in the labor market. That's a 100 percent tax -- for every dollar a person earns (loses) he loses (gains) a dollar in government benefits, respectively. Jared Bernstein presents the facts, especially this chart. The official measure is cash income, and the alternative measure adjusts the official measure for all of the government taxes and benefits people pay or receive. Bernstein thinks that the government has done well here, when it fact this reveals how excessive the benefits are. I jump the video ahead to the 8:38 mark because it consists of a full 8 minutes digression on the month-to-month time path of the money supply during 2008. Rewind if you want to hear that part.